Explanation: A satellite galaxy of our Milky Way, the Small Magellanic Cloud is wonder of the southern sky, named for 16th century Portuguese circumnavigator Ferdinand Magellan. Some 200,000 light-years distant in the constellation Tucana, the small irregular galaxy's stars, gas, and dust that lie along a bar and extended "wing", are familiar in images from optical telescopes. But the galaxy also has a tail. 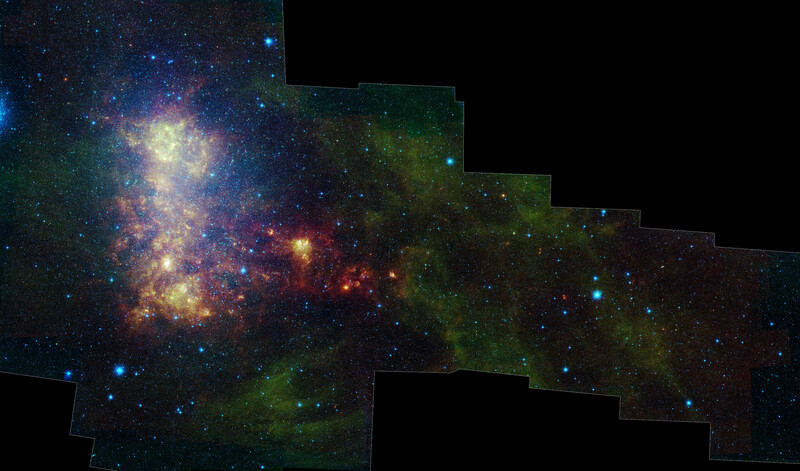 Explored in this false-color, infrared mosaic from the Spitzer Space Telescope, the tail extends to the right of the more familiar bar and wing. Likely stripped from the galaxy by gravitational tides, the tail contains mostly gas, dust, and newly formed stars. Two clusters of newly formed stars, warming their surrounding natal dust clouds, are seen in the tail as red spots. hosted by the Amateur Astronomers Association of New York on Friday, January 8 at the American Museum of Natural History, NYC.